This story has several long beards. 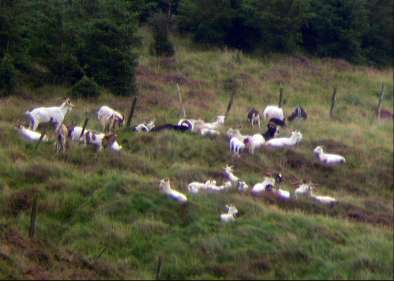 After combing the forests of Benevenagh during several exhausting expeditions our wildlife team finally reported that the herd of wild goats, which lives in the wilds of the mountain, seems to be prospering. We counted thirty to forty animals and there are even a few promising looking youngsters. Let's hope they all make it through the winter. Limavady has just become a 'One Horseshop Town' because a new establishment that sells equestrian equipment to horses and their owners has just opened in Market Street. 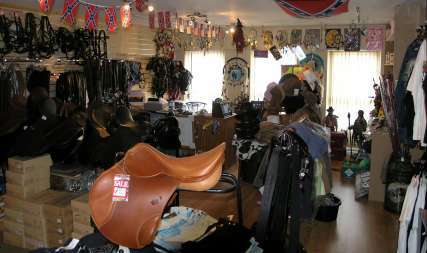 They offer obvious items like bridles and saddles as well as Western paraphernalia and John Wayne posters - a character who features prominently in another part of this astonishing site. A word of advice though. The shop is up a staircase with at least three 90 degree bends. So if you plan to bring your horse along for that extra special fitting, take lots of carrots! 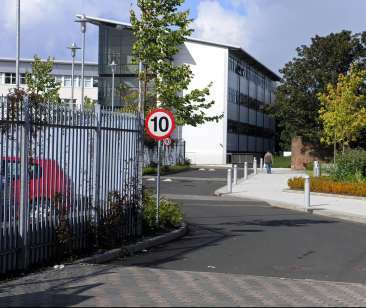 On the 19th day of this month the teaching staff of all Further Education colleges in Northern Ireland went on strike for higher pay. Our highly motivated educational correspondent got up as early as 11 0'clock in the morning to take some pictures of mean-looking pickets guarding the local College. Rather than admire a group of tough acting men in snappy suits he saw no-one at all - apart from a lonesone student wandering up the drive trying to work out what it was all about. What is the world coming to if you can't even have a decent strike with some colourful home-grown pickets?